A beautiful way to display the new US National Park Quarters! Starting in 2010, the US Mint began issuing quarters to commemorate the National Parks in each of the 50 United States. The US Mint releases the quarters in the order in which each state&apos;s featured National Park was established. The America&apos;s Natural Wonders National Park Quarters Collection Map by USA-Collectibles.com is a beautiful way to display these quarters. Each map is designed with the collector in mind. Manufactured with extra thick board and recessed coin slots to protect your quarters and prevent them from being scratched. 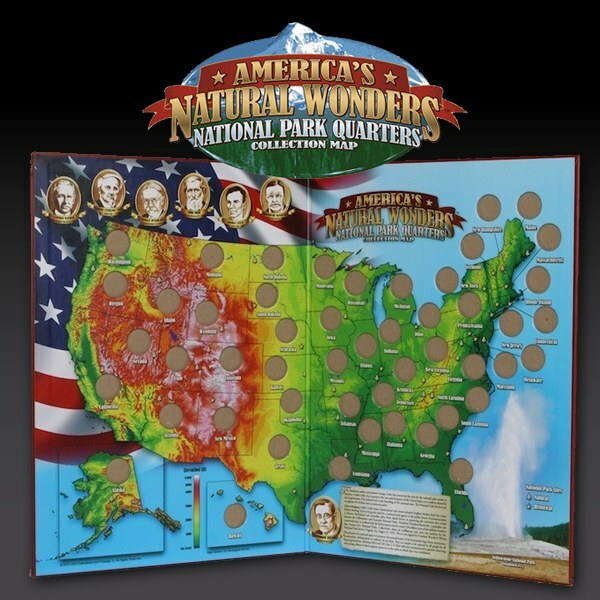 The map also features historical information on the founding fathers of the National Parks and a complete listing of all the quarters that will be released in this series. The location of each park is designated with a gold star or tree. Gorgeous imagery and leather look binding will ensure your collection is kept safe for future generations to cherish.